Step 1.åÊPour the melted strawberry ice cream into a silicon loaf pan. 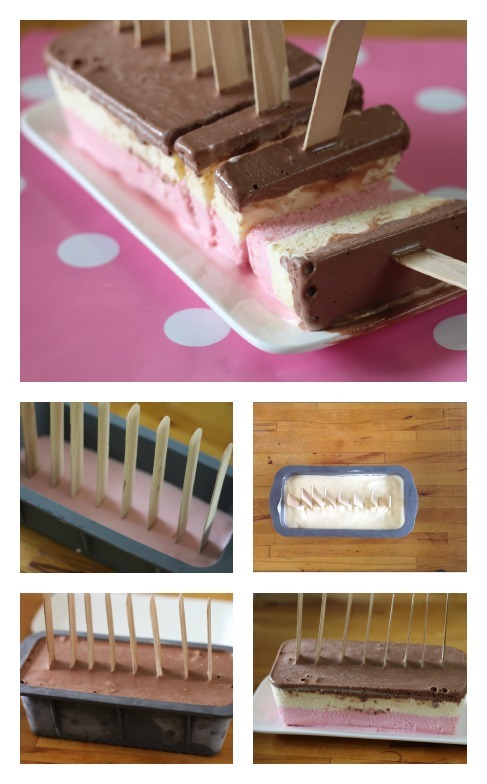 Freeze for 2-3 hours or until set, then carefully push the 8 popsicle sticks into the ice cream, an even distance apart. Step 2.åÊNext, pour in the vanilla ice cream and freeze for another 2-3 hours, or until the second layer has set. Step 3.åÊPour in the chocolate ice cream and freeze for a further 2-3 hours, again waiting for the final layer to set. Step 4.åÊRemove from freezer and flex the loaf pan (the same way you would pop an ice cube out of the tray) to remove the ice cream block. Slice in between popsicle sticks and serve. I recommend that you pop the serving dish in the freezer too. This helps it stay cold while you are serving. If you don’t have a silicon loaf pan, you could line a rigid cake pan with baking paper and then dip it in warm water to turn the cake out. I used neapolitan flavours but you can use any ice cream that you like. Peanut butter, caramel and chocolate flavours would also be nice.